My gardening is going grandly. In fact, I grew everything in this salad except the dressing. One of the greatest things about growing your own vegetables is that you can eat nearly every part of the plant. 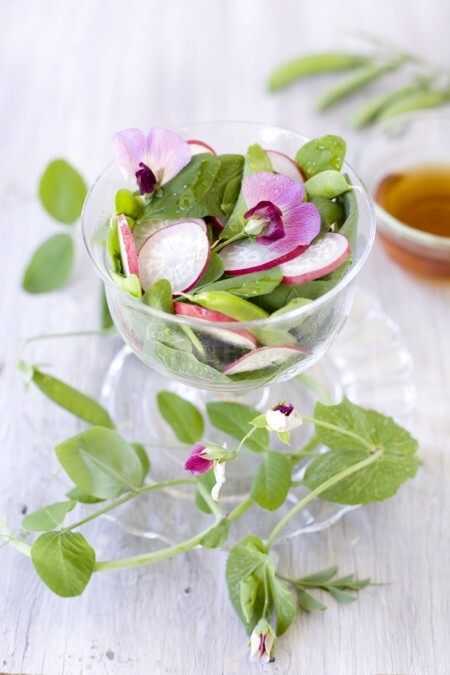 This radish salad is not only sweet peas and radishes, but also contains their greens and flowers. This is my new favorite salad, I may be addicted! I’m growing two varieties of peas. 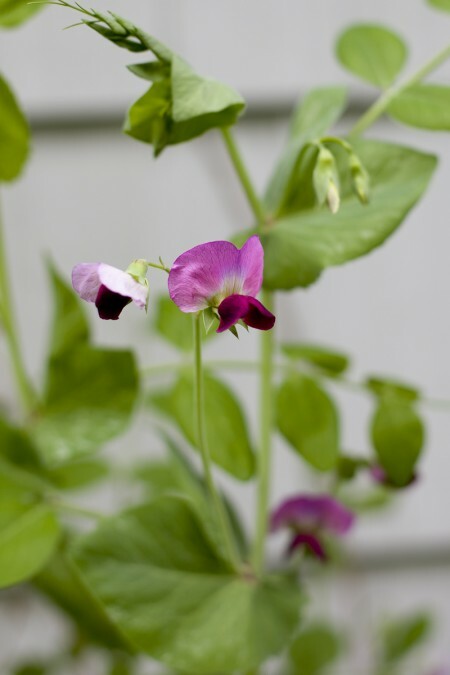 These sugar snap peas have beautiful purple flowers that look like miniature orchids and last week they gave me my first 10 pea pods. The sweet pea plants out front have bright red blooms and still haven’t produced any pods yet. When you grow your own food, you can pick it incredibly fresh. I’ve always loved sugar snap peas, but never have I tasted ones as good as when they’re picked right off the vine! Everything seems juicier, fresher, healthier, more flavorful, I could go on! When I pick lettuce, I sometimes just wash it and leave it on the counter so I can grab a piece to munch on as I walk by. Who knew lettuce could have so much flavor? 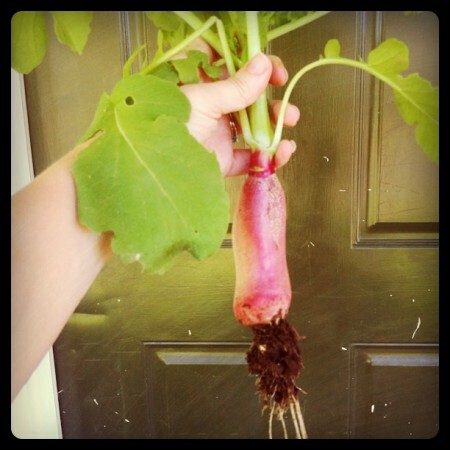 For the radishes, I’m growing French breakfast radishes. They’re slightly milder and more elongated than regular radishes. I’ve let the last of them get a little big as you can see in this photo I took with my phone. This was the smallest one left! Time to pull them all up and plant some more. Because my radish was so huge, I just used one. I adjusted the recipe for normal sized radishes though. My zucchini plant is doing well. I’ve had some beautiful flowers on it and should get plenty of squash. 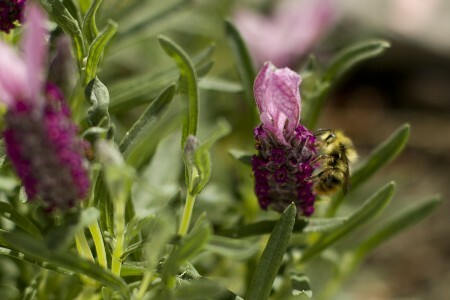 My herb garden is totally thriving and everything I cook is really flavorful! For the salad, you can use any pea in the pod. Some people were concerned about sweet peas being edible. 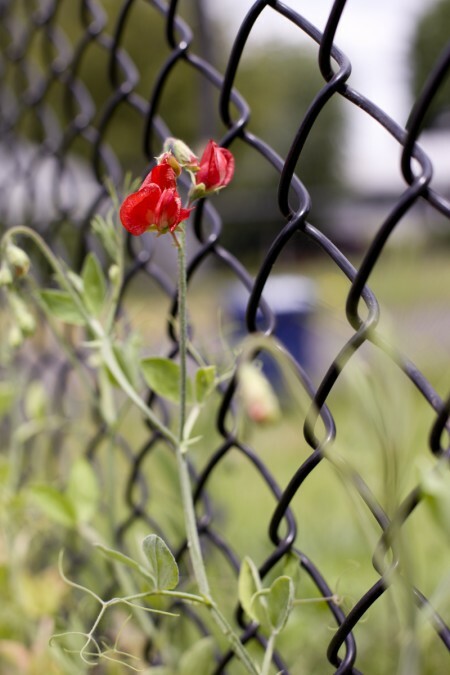 There is an ornamental flowering sweet pea that is NOT edible. But these vines and flowers are from the sweet pea vegetable so can be eaten. I have seen sweet pea vines at Whole Foods or Farmers Markets for over $3 a pound. But I get them practically for free, just a 99 cent packet of seeds!!! I love this maple soy dressing and will definitely be using it for a lot of salads and side vegetables in the future. Wash and thinly slice the radishes. Separate the leaves from the stems and rinse the leaves well, pat dry. 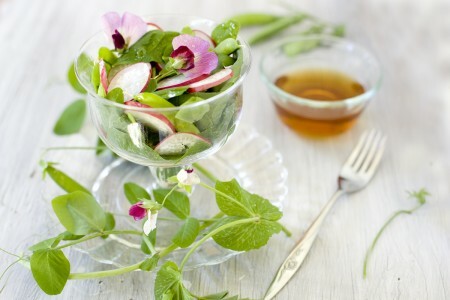 Layer peas, pea leaves and radish slices in two small bowls. Top with sweet pea flowers. In a small bowl, whisk together soy sauce, maple syrup and olive oil. Drizzle dressing over each salad. Approximate cost/serving: If you grow your own peas and radishes from seed like me this costs almost nothing. It was just 30 cents for two so 15 cents a serving! 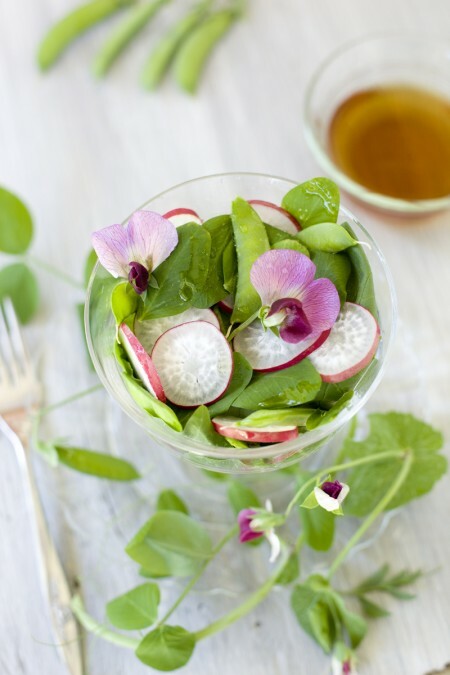 Even if you buy them in the store, radishes and snow peas are very cheap in season. You can use the radish greens and skip the pea leaves. Vegetarian/Gluten Free: This is vegetarian and vegan too. To make it gluten free make sure to use gluten free soy sauce or tamari. Your salad, especially with those beautiful purple flowers, is so stunning! In Japan, they pickled those kind of radishes and they were so yummy that way, too. Thanks Abigail. I have a few left in the garden and think I’ll try pickling them and plant some more in their place! Yes the chalice is from my grandmother. I love it! BTW, is that chalice one from your grandmother? I remember you saying you received a lot of beautiful things from her. It’s gorgeous!